This Carlisle 030203 Classic 2.7 qt. 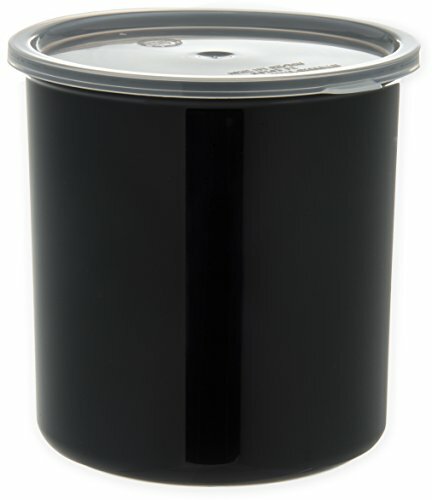 black crock comes with a translucent lid and is suitable for serving and storing bulk food and other items in food service applications. This crock is made of SAN for toughness and resistance to heat. The lid is made of polypropylene for resistance to breakage and fatigue, chemicals, and heat, and it snaps on to the lip of the crock to help prevent leaks and retain freshness. The crock and lid are suitable for temperatures from 0 to 180 degrees F, are dishwasher-safe, and meet NSF International standards for use in food handling and processing. The crock is 6.75" high, its lip is 6.56" in diameter, and its under lip is 6.16" in diameter.